Victoria Almaguer Rodriguez, age 89 of Altus, Oklahoma and formerly of Elsa, Texas, passed away Saturday, November 10, 2018 at OU Medical Center in Oklahoma City. Victoria was born in Donna, Texas on February 19, 1929 to her parents Felipe and Francisca (Aguirre) Almaguer. Victoria was raised in Elsa, Texas until she moved to Altus, Oklahoma in the mid 1960's. 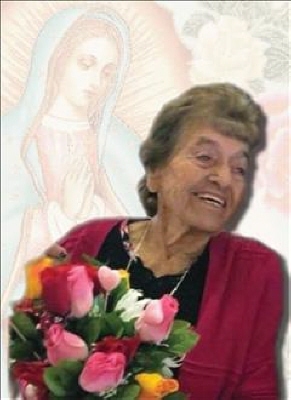 She attended the Catholic Church in Altus where she was very devoted to her Catholic Faith and she always blessed her family and would even bless strangers. Victoria loved to dance, travel to south Texas to visit her brothers and sisters, she enjoyed shopping for shoes and purses, she loved to tell jokes and make people laugh, especially when someone was feeling sad. But above all else, Victoria was deeply devoted to her faith and she truly treasured spending time with all of her family and she will be missed very much. Preceded in death by her parents, her husband Adan Rodriguez in 2009, her son Adan Rodriguez, Jr., two brothers, Domingo Almaguer, and Benjamin Almaguer, three sisters, Romana Almaguer Rodriguez, Cruz Almaguer Gonzales, and Ernestina Almaguer Gonzalez, and five grandchildren. Victoria is survived by two sons, Ruben Rodriguez and wife Audelia of Grand Prairie, Texas, and Mike Rodriguez and wife Margaret of Altus, eight daughters, Eva Rodriguez of Tipton, Oklahoma, Elena Landa and husband Felipe of Altus, Estella Gloria of Altus, Rosa Lopez of Altus, Mary Bautista and husband Rudy of Muskogee, Oklahoma, Becky Lucca and husband David of Sunrise, Florida, Emma Flores of San Antonio, Texas, and Yolanda Rodriguez of Altus, two brothers, Jose Almaguer of South Bend, Indiana, and Manuel Almaguer and wife Maria of Mercedes, Texas, forty-one grandchildren, one-hundred-eighteen great grandchildren, sixty-six great great grandchildren, as well as numerous nieces and nephews, other family members and friends. There will be a Rosary Vigil will be from 6:00 pm until 8:00 pm on Tuesday evening, November 13, 2018 at Lowell-Tims Funeral Home Chapel in Altus with Deacon Eulis Mobley officiating. Catholic Funeral services will be at 1:30 pm on Wednesday, November 14, 2018 at the Prince of Peace Catholic Church in Altus with Rev. Fr. Cory D. Stanley officiating. Interment will follow at Altus City Cemetery under the direction of Lowell-Tims Funeral Home and Crematory, Altus, Oklahoma. To send flowers or a remembrance gift to the family of Victoria Almaguer Rodriguez, please visit our Tribute Store. "Email Address" would like to share the life celebration of Victoria Almaguer Rodriguez. Click on the "link" to go to share a favorite memory or leave a condolence message for the family.